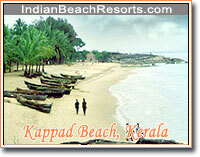 KAPPAD BEACH IN KERALA is located near Calicut. This is the historic place where Vasco de Gama visited on the 27th of May 1498, A.D. with 170 men and three vessels. The rock studded, beach is known as Kappakadavu. The sprawling rock that protrudes into the sea is an interesting feature of the landscape. The temple situated on the rock is about 800 years old. The major city Calicut is the nearest place for this beach. The landing of Vasco de Gama at beach changed the political scenario of India, which ultimately ended with its colonization By the Brithish. It remained under the control of Madras presidency till the formation of Kerala in 1956 after independence. The Kappad has got always something special to offer. Yearly decorated by the Monsoons and washed by tides twice a day. There is swaying palms, sunshine, lots of water, sea breeze lots more to enjoy. The best time to visit here is from September – February. The moss covered solitary pillar, saluting the event of Vasco da Gama’s arrival is attractive. The beach gives you with a calm and serene atmosphere. There is Ayurveda Health spot which offers oil massages, ayurveda cures and many other health services to the tourists. Your tour to the beach will remain incomplete without having chat with the fisherman about their trade, lifestyle, daily duties, culture and above all wetting your feet in the warm waters of the Arabian sea. Enjoy when you’re living, for you are a long time dead. Remember: The first preference for happiness is by enjoying nature’s beauty which is Created by god. The nearest airport is the Karipur international which is about 23kms from Calicut Town and the nearest railway station is Calicut only about 16kms away from Kappad. However most tourists prefer water route down the picturesque backwaters of Calicut On the river named Korappuzha which leads to the beach.